We’d love your help. Let us know what’s wrong with this preview of Not Your Typical Dragon by Dan Bar-el. Crispin wonders if he’ll ever find his inner fire. But when a family emergency breaks out, it takes a little dragon with not- Everybody knows your typical dragon breathes fire. To ask other readers questions about Not Your Typical Dragon, please sign up. I've not had great luck with the Imagination Library, they're book choices are... odd... usually overly wordy and lacking in, dare I say it, imagination. They're not the greatest books. But, they're free entertainment, plus they come in braille for my son who will always need large print if they decide not to teach him braille skills. We both took one look at the cover and decided we loved this book, we read it right away, and what's more exciting is after reading it we love it even more! There's I've not had great luck with the Imagination Library, they're book choices are... odd... usually overly wordy and lacking in, dare I say it, imagination. They're not the greatest books. But, they're free entertainment, plus they come in braille for my son who will always need large print if they decide not to teach him braille skills. There's such a powerful underlying message to this story. My son sees a dragon breathing out funny things and giggles wildly at his misfortune and I have to admit it's incredibly adorable, but beneath the sillyness is a message of acceptance and love that's just so beautiful. Yes, Crispin is different, and maybe his family was disappointed at first with having an abnormal family member, but all that dragon-societal pressure to conform to match the perfect, fire breathing dragon code of normality means nothing in the end because Crispin's family loves him just the same. Great marriage of a good story, AND fine illustrations (by Tim Bowers). A little dragon with the fantastic name of Crispin Blaze seems able to breathe everything BUT fire. The baby dragon is certainly not your typical dragon. 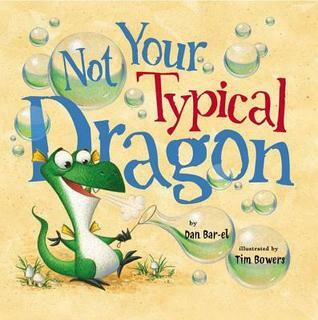 A funny and beautiful story about a young dragon who can't breathe fire. My son laughed with every turn of the page that showed the dragon breathing ridiculous things like whipped cream and bubbles. Also a great message about it's okay to be different, but it doesn't overwhelm the story. The illustrations are delightful as well. Poor little dragon can't even light his own birthday cake! He can however breathe out marshmallows, beach balls, and other ridiculous things. My 4 year old laughed at every page. Enjoyable read. This fantasy book is about a cute little dragon that does not have the typical fire breathe. He gets help from a new friend that is a Knight trying to find a dragon to fight. At the end of the story the dragon, the knight and the dragon's family find out that there is a reason why He is not a typical dragon. The whole story tells how its fine to be different. This book gives a good lesson! Show the cover and read the title. "This book is called, Not Your Typical Dragon. What do you think it is going to be about? What do you think the problem is going to be?" Opening move: Prompt predictions based on title. "Have you ever felt like you don't fit in, or can't do what you're expected to do?" Opening move: Prompt brief sharing of personal experience to the topic or theme. "Well this story is about a dragon who felt like that, too. This Dragon couldn't breathe fire like the other Dragons." Show the cover and read the title. 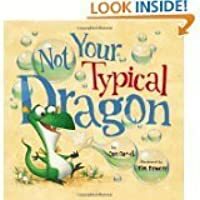 "This book is called, Not Your Typical Dragon. What do you think it is going to be about? What do you think the problem is going to be?" "Well this story is about a dragon who felt like that, too. This Dragon couldn't breathe fire like the other Dragons." Opening move: Foreshadow the problem of the story. o	Summary: This is a book about a young dragon named Crispin Blaze. On his 7th birthday, he cannot wait to finally be able to breathe fire. Sadly, his wish does not come true. Instead of breathing fire he breathes out whatever goes along with the situation he is in. He breathes out Band-Aids, marshmallows, and ton of other things. He is not your typical dragon. He meets a knight that is unlike most knights you would meet. Together they try to figure out why Crispin cannot breathe fire. They don’t have much luck. When Crispin’s father is defending him, he goes a little overboard and cannot stop breathing fire on everything. The town is about to be ruined until suddenly Crispin saves the day. He breathes out water and puts out all of his father’s flames. Crispin is not your typical dragon but he is the dragon that is needed. o	Individual students who might benefit from this book would be any student, especially students who struggle with being different than their fellow classmates. o	Small group use: Students can partner read. It would be fun if the students have a small stuffed animal dragon to read to. o	Whole class use: Read to the class if students are having trouble not fitting in. It can be read for fun and have students act out the different characters in the book. Also can just be read and studied so that it can be tested over for reading comprehension. o	Related books in genre/ subject or content areas: Ballerino Nate by Kimberly Bradley is another book about being different. o	Multimedia connections: Not Your Typical Dragon can be found on YouTube if you search for Not Your Typical Dragon. I love this book! It's a little too long for my storytimes but I might try and read it to my preschoolers because it has a really good message about being ok if you're different. Out of fear that he'll be an embarrassment to his parents, Crispin runs away to live a life of solitude. That plan goes awry when a small knight appears. He, too, has run away in order to avoid embarrassing his family. When he challenges Crispin to do his worst, Crispin breathes out a stream of... marshmallows. Potential foes become friends, and all Sir George's efforts to help Crispin breathe fire are in vain. This is a wonderful book about acceptance. Crispin Blaze the dragon turned 7 and is supposed to breathe fire like the rest of him family, but instead he breathes... bubbles, whipped cream, band-aids, whatever is needed at the time. He runs away in shame and encounters and young boy knight, Sir George, whose father sent him on a quest to fight a fire-breathing dragon. Sir George tries to help Crispin breathe fire, and eventually they become friends. When Sir George's father says that a dragon that doesn't breathe fire is silly, Crispin's Crispin Blaze the dragon turned 7 and is supposed to breathe fire like the rest of him family, but instead he breathes... bubbles, whipped cream, band-aids, whatever is needed at the time. He runs away in shame and encounters and young boy knight, Sir George, whose father sent him on a quest to fight a fire-breathing dragon. Sir George tries to help Crispin breathe fire, and eventually they become friends. When Sir George's father says that a dragon that doesn't breathe fire is silly, Crispin's father takes offense and starts breathing fire until everything is ablaze. Crispin saves the day by breathing water, and Crispin's dad realizes that his son is something special. This was a wonderful tale of friends trying to work to help each other out. 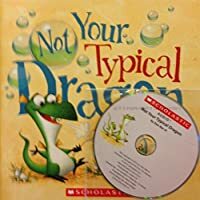 this was a cleverly written book about a dragon that outcast because he couldn't breathe fire and a young knight that's helps him try to breathe fire. -K-3 would be ideal for this book. -Help students realize that everyone is different. -A kid who feels left out. -I think this book should be read to the whole class with teacher led discussion rather than used in small groups. -There is not a multimedia This was a wonderful tale of friends trying to work to help each other out. this was a cleverly written book about a dragon that outcast because he couldn't breathe fire and a young knight that's helps him try to breathe fire. This book is just delightful! I plan on making it a dial-a-story, so look for it when I post it again, and then call in to listen! "For Kevin, who would rather a tickle a dragon than fight one. D.B. & To Betsy and Jeff W. and my CAP (Children's Alopecia Project) friends. Again proving that "not typical" can be the most special. T.B." This was such a fun book to read. I can see children really enjoying this book. I had to read it several times, I enjoyed it so much. I just adore the vibrant illustrations. I am looking on Amazon for a copy of this book today. It would be an incredible mentor text for illustrations, as well as using your imagination. It would also be great when introducing fantasy in the classroom. A little dragon can't seem to manifest his fire-breathing abilities and take his place among the great members of his race. When he tries, no fire comes out! Only whipped cream. Or band-aids. Or teddy bears! Crispin Blaze is a young dragon who is almost 7. On his birthday he is supposed to be able to breathe fire like every other dragon, but he finds that he cannot. He does breathe a variety of other things though. In the end he discovers that breathing fire is not that important after all. Embrace what makes you different; that is the moral of this lovely children's book. An extremely loveable dragon who can't blow fire is the main character in Bar-el's story, and as the story progresses you learn along with him that being different can definitely come in handy! This is such a good book! It has quite a few words on the page, and there is a decent amount of pages. So I would read it to children who can sit still and really enjoy a good story. It was very funny and cute. It was well worth the read. I love this book. It's tough to write a good dragon book these days. They have been done and done and overdone. This one, however is refreshing. It breathes new life (and bubbles and whipped cream and teddy bears and streamers and beach balls) into a very old subject. A fun story about a dragon who is not able to breathe fire. He has some other special talents instead. At first he is not accepted, but others see how valuable his specialness is when a problem happens and he is the only one who can fix it. Illustrations are well done and creative. A nice one for celebrating differences and to say that being different isn't a bad thing. Don't rate all the picture books I get to read, however, this was a nice find. A sweet and well-written story with fun illustrations! Love when I find a new book to read to first grade! Dan Bar-el is an award-winning children’s author, educator and storyteller. His writing includes chapter books, picture books and graphic novels. For the past twenty-five years, Dan has been working with children ages 3 to 13. He’s been a school age childcare provider, a preschool teacher, a creative drama and a creative writing teacher. He’s developed a multitude of creative activities for childr Dan Bar-el is an award-winning children’s author, educator and storyteller. His writing includes chapter books, picture books and graphic novels. For the past twenty-five years, Dan has been working with children ages 3 to 13. He’s been a school age childcare provider, a preschool teacher, a creative drama and a creative writing teacher. He’s developed a multitude of creative activities for children including movie making and a radio show involving school-age childcare centres across Vancouver. As a preschool teacher, Dan created Stories in Our Own Words, a program for 3 & 4 year olds based on the ideas of famed educator and author, Vivian Gussin Paley that fostered the development of the children’s own stories by recording them and then acting them as a group. In the past, Dan trained and worked professionally as an actor, has written for theatre, as well as written and performed comedy across Canada. These days, when not writing or teaching writing to children through the organization CWC, Dan merrily travels around the country visiting many schools and libraries. Hiking and travelling are two of his passions. In 2004, he completed the 800 km pilgrimage walk to Santiago de Compostella in Spain, and more recently, he did the Inca Trail to Machu Pichu in Peru. Cooking, baking and eating the results of said efforts are some of his others pursuits. Dan lives in Vancouver, BC with his wife, artist and goldsmith, Dominique Bréchault, and Sasha, the most adorable cat in the known universe.